I think the big debate here is: Are the Finns just rude and don't appreciate or give good customer service or is it just a cultural thing. Perhaps they are not really intentionally trying to be rude, but it is a perception of outsiders used to a different level of service that their level comes across as rude. I personally was shocked in regards to one experience I had after I had just arrived to the country. I needed to change the car from summer tires to winter tires so I went to a local tire shop in order to do that. First of all, when I asked the guy behind the desk if he spoke English, he said "no", but then spoke English anyways. I noticed he said the same thing to every non-Finn who came to the shop looking for tires. Sure, he might have wanted people to attempt Finnish, but rudely saying "No" to everyone who asked wasn't really a nice move. Then later it came time to get my car as it came off the platform. I tried to drive away, but the key did nothing. Some message then came on the screen which referred to the electronic system. Everything was fine before coming to the tire shop and now since they changed tires I cannot start my car. I asked for some help, but no one seemed like they cared or had the time to help. Some guy turned the key a few times and finally after some minutes they just proceeded to push my car out of the garage into the yard without saying a word. Now I was in the parking lot with a car that doesn't start and not sure how to handle it. So, then I go talk to the manager who acts surprised but gives no help at all. Almost like he just wanted the situation to go away. I called my wife, who then attempted to call the place, however, they simply did not answer the call. She finally got a manager of the entire chain on the line, who was apologetic but unable to help. I went back to my car and after monkeying around with the engine for a while and having my wife search for technical solutions online from her office, the car finally started back up. I took a deep sigh of relief and then raced over to pick up my son at school. I think even Finns would admit that this was bad customer service. I have already blogged in the past about numerous stories of frustration that my wife and I have had when dealing with Finnish banks. I was rejected many times for simple credit cards and we were rejected by banks for loan applications. Finally a good story to share when a very friendly and accommodating Finn at Danske Bank (formerly Sampo Pankki) helped us get a good rate and loan on our new home. 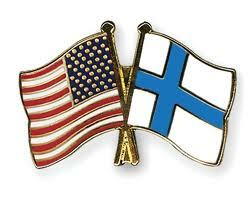 See my earlier blog article (2012) on "Do Finns trust foreigners" for more about this experience. Also, in spite of my horror story at the car shop, we were finally able to find a friendly car repair shop in Espoo with a very friendly owner who normally accommodates our needs. I just have to remember these pleasant situations and understand that there are indeed exceptions to the rule. Another expat shared a story about how he offered to open the door for an older gentleman and after the man walked through the door and said nothing, my friend said "you're welcome". The Finnish man then proceeded to say "Well, I never asked you to open the door for me" rudely and walked away. :) Hmm, it seems like many Finns just don't want the help, they want to "do it on their own". Trust me, I know from experience myself that Finns are forever independent and proud and generally shy away from help. They do not seem to want to owe anything to anyone. I am still a bit torn over whether to chalk off these experiences and stories as rude and unacceptable behavior or just part of the culture that needs to be accepted when living in someone elses country. I don't expect things to be just like in the States when living in Finland, but I do think some form of customer service should be practiced by Finns. Sure, in the US we have much higher level of customer service and many people's livelihoods depend on the cash they receive from tips and such. Still with that said, one should not feel entitled in their jobs just because they know they will not receive anything extra or lose their job because of it. So, I actually do think that the Finns could learn a bit about customer service in the States and perhaps change their habits a bit to make their country a better place to live. Sure, every culture is different and no country is perfect, but I think it is pretty safe to say that if there is something that the Finns can improve on, it is definitely customer service.